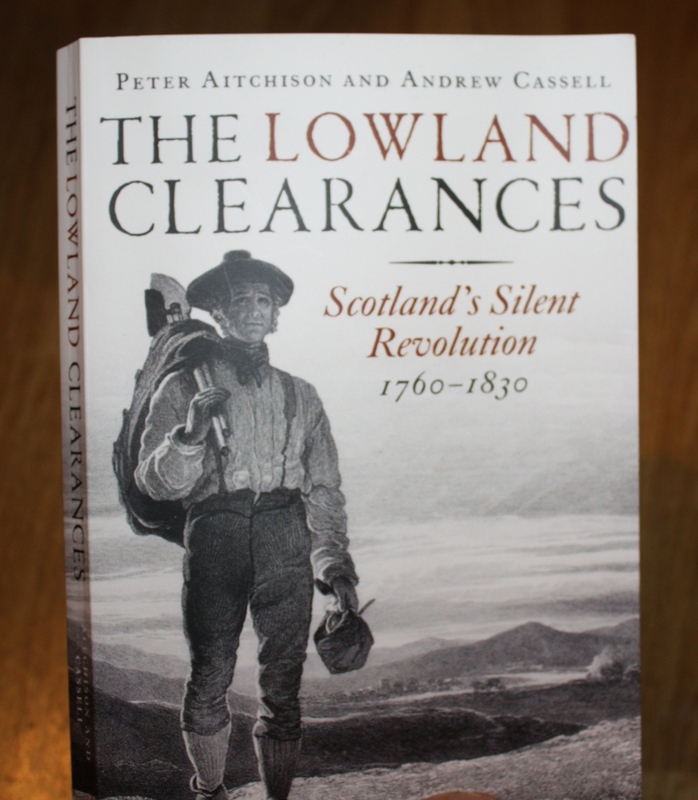 I’ve just finished reading a very interesting book: The Lowland Clearances, by Peter Aitchison and Andrew Cassell. I’ve previously written about the Highland Clearances, and discussed some of the myths that have been created about that episode of Scottish history. The Lowland Clearances have received much less attention from historians, yet they paved the way for the clearances further north, and involved tens of thousands of people who lost their homes. The process was often referred to as ‘land improvement’. There were far fewer protests. One reason for this was that the Lowland tenants who were cleared had more of an economic relationship with their lairds, and understood that their leases might not be renewed, whereas in the Highlands the relationship was more feudal and tenants believed that the landowners had more obligations towards them. The Lowland Clearances occurred over a longer period, and generated less publicity. Another reason was that alternate sources of employment, in the cities of Glasgow, Edinburgh and Dundee, were closer at hand. Many displaced small tenants became workers in the new industries that grew up in those cities as part of the industrial revolution. Because the new Lowland farms grew crops and kept cattle as well as sheep, there were more opportunities for employment as farm workers. In the north, although attempts were made to encourage new industries in tanning, cotton, flax, salt, brick and lime manufacturing, and coal mining, many ultimately failed. Although some of the Highland lairds built planned villages and invested in new industries, the Highland economy did not develop as it did in the south. The markets were too far away. The end of the runrig system and the destruction of fermtouns in the Lowlands allowed for the development of commercially viable farms, and many in the south prospered. Even so, 60,000 people from the Lowlands emigrated between 1700 and 1780. Often, they had previously tried to make a living in the cities. When the Highlanders emigrated, because of their shared culture and distinct language, they tended to stick together in their new homes in Canada and elsewhere, rather than dispersing like the Lowlanders, and this helped to keep their traditions and memories intact. Aitchison and Cassell point out that in some parts of the north of Scotland where the old village structures were not destroyed by the Clearances there is currently growth and vibrancy – they give Sleat, in Skye, as an example – and they compare this with the “the big farming landscape peopled by a few subsidy junkies” of the rural Borders. Well, I’m glad the cleared folk in the Lowlands didn’t complain to the umpire about money grubbing capitalist basturns and tried to show no pain. Unlike the Highlanders who owe a great thanks to that great Scotsman, the Duke of Sutherland, whose fine statue is still dominating the Highlands and being worshipped by the sheep. More likely the Lowlanders could quickly see that the new farms were far more efficient, and produced more food (and some jobs), and that this would mean an end to starvation – as had happened further south over the previous century. In the Highlands, however, the land was less productive. Now where is this ‘further south’? Scotland or England? is there a good book that covers this? First heard of the book ‘Lowland Clearances’ at our newly formed local history group in the Glenkens. We’re hoping to have at least one of the authors to speak later this year. If you take the time to read the book you will see that the ‘improvements’ came at a cost of human misery. Once land was surrounded by dry stane dyke the tennant was obliged to do as his landlord said- at his own expense, and then pay a rent many hundred % higher as a result. The end was the same; starvation misery and eviction. Very many lowland villages simply disappeared from the map and from history as they did later in the highlands. More Scots were forced to emmigrate from the Lowland Clearances than did from the Highlands. Nowadays Lowlanders tend to clear out voluntarily, and who can blame them, even if they only migrate as far as the English outpost of Edinburgh. Some of the towns in the Borders are doing better than others. I can’t seem to reply directly to your comment above. I think my use of a dash perhaps confuses what I was trying to say in that reply to ‘statue’. What I meant was that the changes in the Lowlands meant that there was eventually less hunger there. Roughly the same sort of changes had happened further south, in England. These changes had also resulted in less hunger. BTW – I see that there are renewed calls to pull down the statue in Sutherland. Your planned event sounds very interesting. Thank you for your comment of 11 July above. I’m not sure whether your comment is directed towards what I have written or to Don. Many of the people involved in the process of Lowland Clearances, and many who commented on them at the time, saw them as ‘improvements’. Obviously, I doubt whether many of those who were cleared regarded the process as improvements. Whether improvements or not, they certainly amounted to economic change. The changes were a similar process to what had happened earlier during the enclosures, in England. Without the ‘improvements’/economic changes one can only guess at what the economy of the lowlands might have been like in further decades, but what happened in Ireland later on gives a big clue. Of course, with any drastic economic changes in such circumstances, there were evictions and misery, though as for starvation, or rather more starvation than was normall for such times, you would need to provide evidence to prove your case. But little, if any, of what you say is relevant to my original post, which was concerned with trying to understand why there were fewer protests at the time in the lowlands than there were later on during the Highland Clearances. Hi Roddy, been having issues with the technology so apologies for the tardiness of the reply. As we have established, the Lowland clearances paved the way for the later more infamous Highland clearances, my own impression for why not more has been made about the Lowland clearances are simply that they took place over a longer period of time and against the backdrop of the agricultural and industrial revolution, They also lacked the attention grabbing violence of the later period. The phenomena of the migration into the towns and cities away from the land has to some degree distracted attention away from the story of what was happening to the cottars and their villages that have all but vanished from the land and from recorded history. The Lowland clearances were not accompanied by the violence and the general sense of bitter injustice that followed the Highland clearances that make for a more attention grabbing narrative. Being forced off your land, having ‘improved it’, because you could no longer afford the resultant exorbitant rents demanded by landlords hardly commanded the sympathy of people living in the grinding poverty and third world squalor of the industrial belt well into the 20th century, whereas people burned out of their homes by vindictive factors resonated in everybody’s heart, rich or poor. It was the Catholics that were complaining in the highlands, not the presbyterians. In highland there was no law, in the lowlands there was. Lowland history is better documented than highland history, it is easy to make up stories of malpractice when there are no witnesses. The fact is people were starving and food production was the only way to change the situation. The vast majority of Scottish history has invented by the SNP. The fact is Catholics and Presbyterians have been killing each other since religion was invented. The SNP has taken the Catholic complaints and called them Scottish while referring to the Presbyterian side as English. Thus Celtic v Rangers has become Scotland v England, people and governments are buying this wholesale. The recent supply of books are all one sides. If you say to people today show side are you on Scotland or England …obviously people will say Scotland, at least the writers of the books will say Scotland, as will all Scots. This fraud has been invented by the SNP in order to gain power. Real history is Celtic v Rangers, of course it is against the law to sing football songs which are real history, it is against the law to say what you think about religion. It is perfectly legal to talk of govt malpractice. The whole thing is a fraud. Not sure how to reply to such a collection of absurd assertions. No law, no witnesses? Says you! I suppose it would be churlish of me to point out that religion was around for thousands of years before there ever was even a Christian church let alone sects to fall out with each other, and a thousand years between the advent of the catholic church and the Presbyterians. But then why let the truth get in the way of a good rant, eh? Suffice to say that I am not a member or spokesman for the SNP but it seems to me that just about every Unionist I have spoken to trots out this same line ‘its all SNP lies’ when the facts do not correspond to their own prejudices. It would not correspond with your prejudices for example to concede that the SNP government and MPs in Westminster are loaded with …gasp…English people! Angus Robertson SNP leader in Westminster; half English half German. Now who else does that remind me of?